Steve Dale is fairly well known in the pet world. Steve Dale has arguably the most well read syndicated pet column in America, “My Pet World” (Tribune Media Services). He’s the host of two nationally syndicated radio shows, Steve Dale’s Pet World and The Pet Minute (Black Dog Radio Productions). He’s also heard weekly with a line version of Steve Dal’s Pet World on WLS, Chicago and with a separate On Demand version of his show. Steve’s also a contributing editor at USA Weekend, and Cat Fancy magazine. Steve is also a dog and a cat behavior consultant (certified, International Association of Animal Behavior Consultants), and he speaks at veterinary and animal welfare conferences around the world.. I am a journalist, not a veterinarian. At this moment, I am ashamed for my profession rather than the veterinary professional targeted in an ABC-TV “20/20” story called “Is Your Veterinarian Being Honest With You?” which aired November 24. The “20/20” piece was essentially a replication of a report that recently aired on Canadian TV. 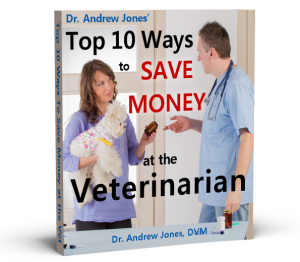 What both segments have in common is Dr. Andrew Jones looking into the camera, and telling pet owners that veterinarians are essentially ripping them off and preying on their emotional attachments to their pets. Jones, who has a checkered history practiced in British Columbia, Canada, and is hawking a book called “Veterinary Secrets Revealed,” and a DVD entitled “Healing Your Pets at Home.” More later on why that DVD title flies in the face of good medicine, and why I believe Jones is actually the one preying upon pet owners. By the way – there’s no typo here – Jones no longer practices veterinary medicine. He quit in 2010, just after he was fined by the British Columbia Veterinary Medical Association (for multiple offenses, ranging from false claims on products with his name on them, to denigrating other veterinarians). In fact, in my opinion, it’s Jones who is dangerous; his DVD “Healing Your Pets At Home” is indisputably contradictory to responsible medicine. Our pets can’t tell us when something is wrong, and no matter, until pet owners have stethoscopes at home and are trained to hear heart irregularities, can do blood work in their kitchens to test for the likes of tick or heartworm disease, avoiding regular veterinary check ups is medically not in our pets’ best interest. Quite apparently, selling DVD’s and books is in Jones’ best interest. I personally don’t know Steve Dale, and his work seems on the whole positive, but he is fairly comfortable publicly denigrating me. If he had bothered to do any background research, he would see that I was never on Canadian TV telling pet owners that vets are essentially ‘ripping them off. The TV show he was referring to did not feature me. On the 20/20 show I reported that in my experience some veterinarians overcharge, but that most do not. I in fact owned up to overcharging at times while practicing and owing my own veterinary practice. My ‘checkered past’ of 17 years of veterinary medicine involved zero client complaints to my governing body. I saw thousands of pets, performed thousands of surgeries, and throughout that time there was never a charge against me involving veterinary care of an animal. The ‘checkered past’ that Mr Dale refers to relates back to how the College took issue with my online book, newsletter and reports. I advise in virtually all of my publications regular veterinary exams- in fact I advocated for that on the ’20/20’ show. My point is empowering pet owners, who in fact, are the best advocates for their own pets. Clearly veterinarians are not the answer to everything for the care of your pets, in spite of what Mr Dale suggests. He seizured alone in the clinic while unobserved and is now paralyzed. My point in all of this is to lend some perspective- all is not well in animal health, and there are millions of North American pets not getting any veterinary care, for their owners can’t afford it. Yes I do make some money from selling my DVD’s online, although it isn’t a tonne. I would suspect that Mr Dale makes far more speaking at veterinary conferences. ummmm, who the heck is Steve Dale????? Never heard of him, but I would say he needs to stick to what he actually does for a living….he is a behavior consultant…not sure what that has to do with medicine yet he feels he is an expert on that too. He is one to talk of “hawking books”….since he does the same! And he makes a living in the media…pot…kettle…black in my opinion….but it’s no shock he defends the veterinary world…dvm360 is littered with his articles on veterinary clients and how he speaks of “his career in the veterinary field” lol….far from unbiased I would say….and making a career out of speaking at veterinary conferences….no wonder he feels compelled to defend those who make money for him!!!! !